Bagni di Lucca - What to see? Starting from Piazza J. Varraud, a car park, in front of the restaurant Circolo dei Forestieri. The Circolo dei Forestieri (built 1924) was used a meeting point for foreign visitors to the town. It is now used as a restaurant downstairs, with meeting rooms and exhibition space above. Adjacent is the Teatro Academico (1790). Recently restored into a small, but stylish and comfortable theatre, used for both professional and amateur productions. The River Lima can be reached by taking the small road that passes between the Circolo and the theatre. This leads to a pedestrian suspension bridge with good views both up and down the river. Retrace your steps and cross Viale Roma to the old English chemist. Take the footpath between the chemist and Antico Caffe di Sonno. At the end of this you will find the English Church, a somewhat decayed mock-gothic building of the 1830's which now hosts the local tourist information office and local lending and reference libraries. Start uphill via Via Whipple. At the bend you can see the ducal stables (1811) with their prominent stone horsehead sculptures. Keep following the road uphill until you reach Bagni alla Villa, with fine views over the town. This is the original part of the town and Piazza Bagni alla Villa contains many large and elegant houses whose previous guests include many notable people who came to take the waters, wall plaques commemorate the visits of Lord Byron, the English poet, and Michel de Montaigne, the 16th century French diarist, among others. 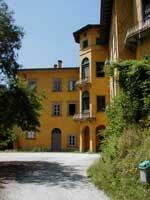 At the end of the Piazza is the Terme del Bagno alla Villa, an interesting, but now closed, spa. Pass this on your left and then turn right into Via Monache. A few metres before this rejoins Via Whipple is a small gateway (marked Villa Ada) on the left. Enter this and take the path up to Villa Ada. This is now closed but was until recently used as a spa. Follow the drive downhill or wander through the, once elegant but now abandoned, formal gardens and rejoin Via Whipple at the ducal stables. Take the small road that passes along the righthand side of these to Via Contessa Casalini, cross this road and enter the public gardens. These offer plenty of shady seating and a small children's playground. Once rested leave the garden via the Piazza XI Zona Patrioti. Immediately in front of you is the 16th Century Palazzo della Lena, now used as the "Town Hall". The lobby contains an interesting three-dimensional plan of the Bagni di Lucca area. Follow Viale Umberto I, the main shopping street of Bagni di Lucca back to where you started in Piazza J.Varraud. The Ponte delle Catene (Chain Bridge - 1840) in Fornoli. Recently restored. Now used only as a footbridge connecting Fornoli and Chifenti on the other side of the river Lima. The Casino (1835) - Ponte a Serraglio. The first licensed casino in Europe and allegedly where Roulette was invented. Also recently restored, now operating as a Tourist information centre. Ospedale Demidoff and Tempietto Demidoff (1828) - between Ponte a Serraglio and Fornoli. 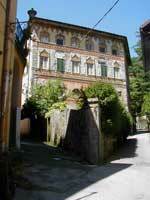 This historic house, and neo-classical temple, prettily situated on either side of the Torrente Camaione. Orrido di Botri - a very deep but narrow gorge carved through the rocks by the Rio Pelago. Now a nature reserve the gorge is home to a wide range of plant and animal life and can be visited in range of organised tours that start from the Corpo Forestale dello Stato centre at Ponte A Gaio. Monte Prato Fiorito - this is the largest of the mountains that surround the town at 1297m. From the town follow the road to Montefegatesi and take the right turn signposted 'Alberetta' about 1km before that village. Follow this road until it stops going uphill and the Prato Fiorito (flowery meadow) side is facing you. The walk up the last 200m metres of altitude is quite easy, if steep in parts. While this feels like the middle of nowhere there is a cafe which is usually open during summer's days.